A sharp chainsaw blade reduces operator fatigue and unnecessary wear and tear on the engine. Plus, dull saws are plain inefficient and dangerous due to potential kickback. 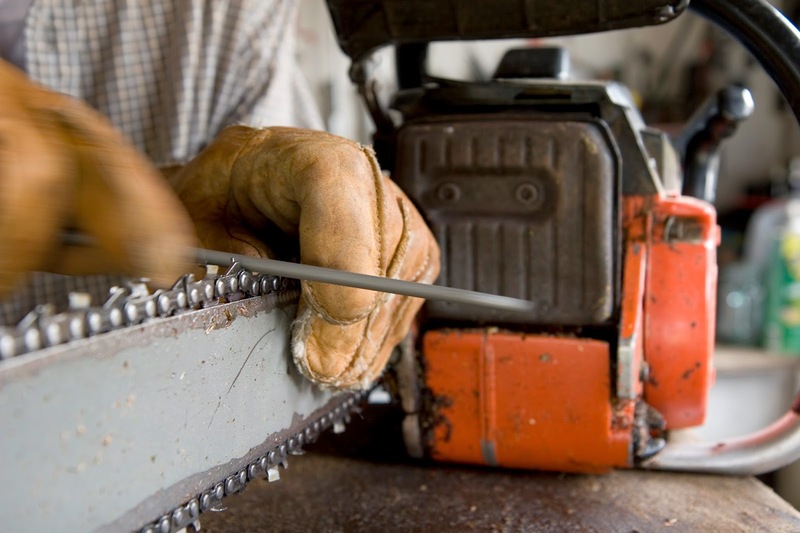 To keep a chainsaw cutting quickly and cleanly, you should sharpen the teeth on a regular basis. That said, the idea can be intimidating, and people often have questions! That’s why we’ve prepared a handy list of chainsaw sharpening FAQ’s to help get you on the right path. When Should I Sharpen My Chainsaw? Check your chainsaw’s waste material. A sharp blade requires minimal force and removes small chips of wood, but a dull blade rides in the cut without advancing and generates sawdust. So, if you’re seeing too much sawdust or other waste, it’s probably time for you to sharpen your chainsaw. Which Parts of the Saw are Sharpened? The saw teeth, or cutters, consist of two components: the dual-profile cutting element and the flat-faced depth gauge. The different angles of the two cutter profiles combine to cut the wood and remove waste. The height of the depth gauge must be adjusted to match the new height of the cutters. What Tools are Required to Sharpen a Chainsaw? There are several options available that would be helpful for you. The most common sharpening technique uses a round hand file on the cutters and a flat file on the depth guide. You’ll also need work gloves, a vise to secure the chainsaw, a file guide, a raker guide, and the owner’s manual. Other stuff you may need: Click here to get new chain or parts for a chainsaw, like chains, adjusters, oil, and other stuff. What Steps Will I Take to Sharpen My Chainsaw? While wearing work gloves, clamp the chainsaw blade in a vise to securely hold the saw. Release the chain brake so the chain turns freely around the blade. Locate the first tooth on the chain or mark the point where you begin to ensure that all the cutters are sharpened. Secure the round file in the guide. Align the guide to the same angle referenced in the owner’s manual. Place the round file under the cutting tooth and push it forward while keeping the file perpendicular to the saw. File only on the forward motion. Use six to eight strokes per cutting tooth. Follow this procedure for each cutting tooth. When the starting point is reached, turn the saw around in the vise and repeat the process. Place the raker guide over three sets of cutters with the center depth guide visible in the slot. Use the flat file to lower the height of the guide to match that of the rear-cutting tooth. Follow this procedure until the height of all the depth guides has been adjusted. This completes the sharpening process. Remove the chainsaw from the vise. Ensure that chain is properly secured before using the saw. Click here for a more in depth description of sharpening a chainsaw. Oh, and before you sharpen with a round file, read this.